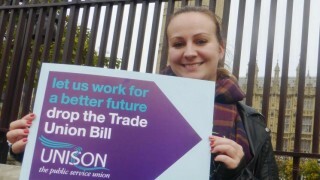 UNISON Cymru Wales members will be taking to high streets and workplaces next week to celebrate the historic achievements of trade unions and warn what society stands to lose with the UK Conservative government’s Trade Union Bill. 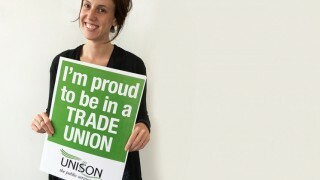 UNISON members are participating in the UK-wide ‘I heart unions’ week of action organised by the TUC to show unions are responsible for winning landmark social change which has benefitted the whole nation. They will be giving out cakes and leaflets to members of the public and also highlighting the unheralded work union reps do every day, fighting discrimination, making our workplaces safe and standing up for the vulnerable. 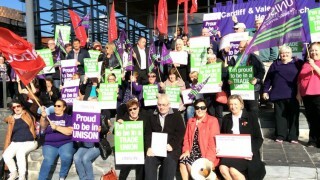 UNISON Cymru Wales regional secretary and Wales TUC president Margaret Thomas said: “This is a great opportunity to remind people that trades union campaigning has helped shaped this country for the good. “It was unions which fought for and won a minimum wage, maternity and paternity rights, pension provision, holiday and sickness entitlements. These union victories have benefited every single British person. “Yet all of these are threatened if the UK Conservative government’s Trade Union Bill is implemented. “The Bill will make it harder for people to join and be represented by a trade union and to ever take a stand against a bad employer. If the Conservatives have their way, low-paid workers in particular – a majority of who are women may lose representation and these are exactly the people who need most support. “No public-sector employer has welcomed this Bill and they have even told the government that it will harm good industrial relations. The UK government’s Trade Union Bill is currently being considered by the House of Lords and last week UNISON Cymru Wales officials convened a successful meeting of Welsh peers in the Houses of Parliament to explain the seriousness of the threats the Trade Union Bill poses and why it is essential Lords vote to oppose the legislation.